HigherVeda is inspired to accentuate the proven healing properties of Cannabis through formulations based in the ancient principles of Ayurvedic Medicine and Cold Water Hash to provide wholesome & effect-based products for consumers who prioritize balance and quality. The ancient science of ayurvedic medicine developed side by side with the early cultivation of Cannabis in the Himalayas. Since then Cannabis has been used both medicinally and recreationally in India to treat a myriad of physical and spiritual issues. HigherVeda believes that the knowledge Ayurveda offers us about Cannabis is a great place to start understanding how best to use this plant today. 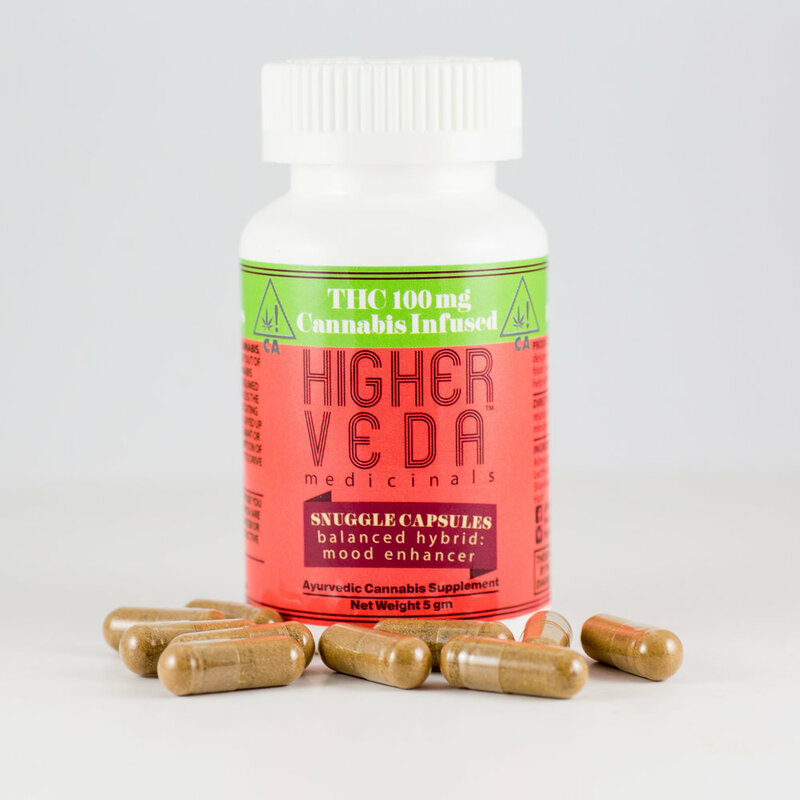 HigherVeda products harness the power of Cannabis to the principles of Ayurveda to create the most reliably effective natural cannabis capsules available. We use organic herbs and super-foods to formulate each capsule for a particular effect. Fire King Cold Water Hash contains a full spectrum of the plant’s natural terpines & cannabinoids. Each formulation is designed to accentuate a specific healing property of Cannabis, while minimizing less desirable effects. 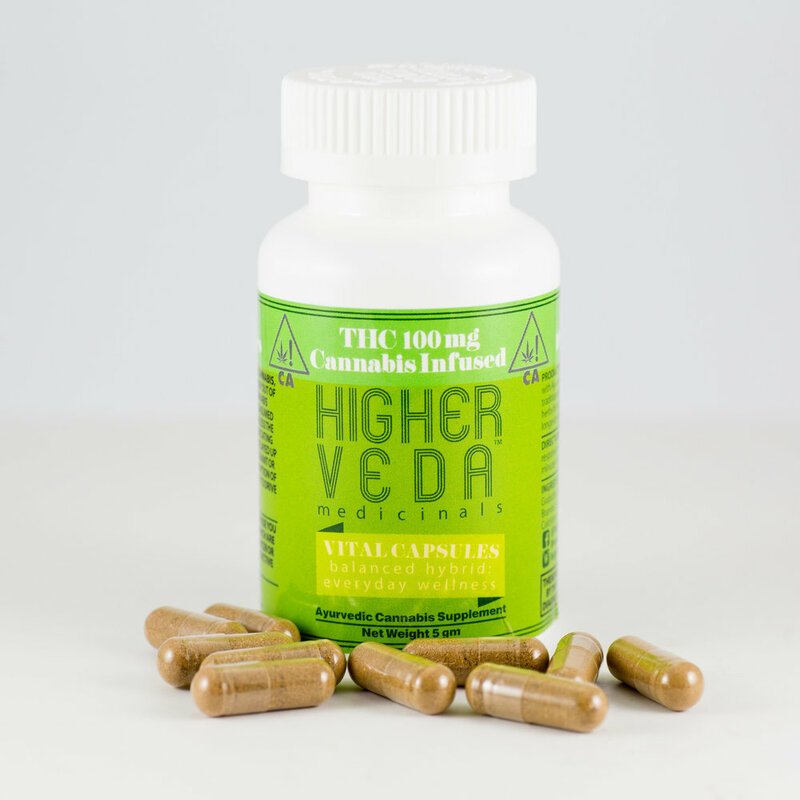 HigherVeda is for when you want an experience to feel enriched, nourished, and elevated. All capsules are made with organic ingredients, use veggie capsules, and are free from wheat, soy, refined sugars and chemicals of any kinds. Nothing artificial. All capsules are vegetarian. Snooze, Snuggle, and Vital are also vegan. Buzz is not vegan because it includes Bee Pollen. All products come in bottles of 10 capsules, each with 10mg or 25mg THC. Our products and the information provided are not meant to diagnose, treat, cure, or prevent any disease. Snuggle is a 'hybrid' formula focused on supporting an elevated mood & reproductive vitality. Snuggle facilitates connectivity and pleasure that is perfect for use with a partner, friends, or even by yourself! The ayurvedic ingredients contained within Snuggle have been used as a substitute for alcohol and opioids, depression relief, soothing nerve pain, increasing sensory experience, enhancing libido, balancing hormones, reproductive health & PMS. Buzz provides a ‘sativa’ experience with long lasting, focused energy for a modern active lifestyle. 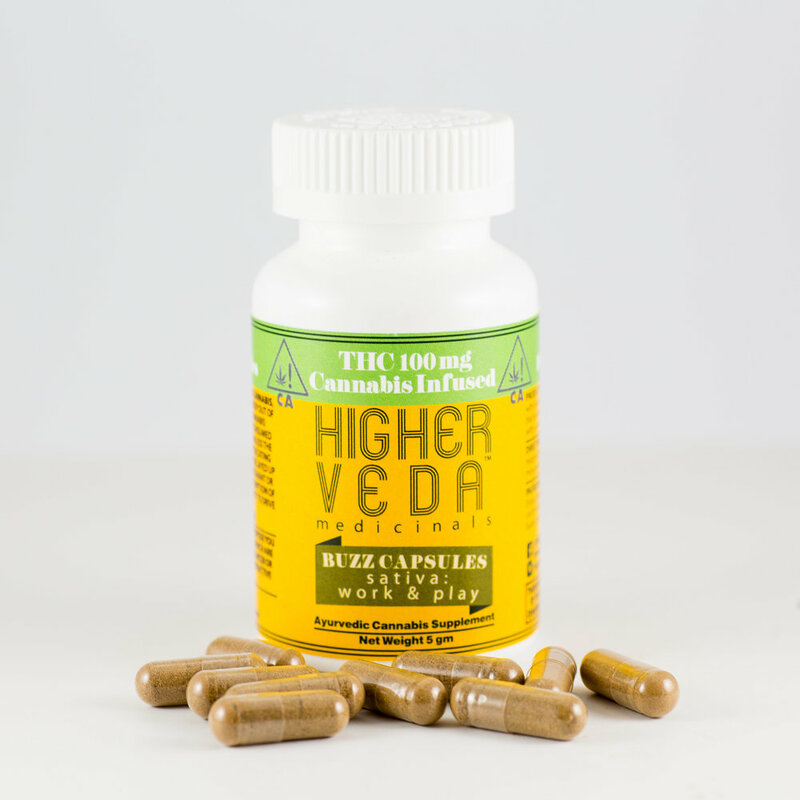 The ayurvedic ingredients contained within Buzz have been used for ADD, ADHD, depression, creative blocks & enhanced physical activity. Snooze encourages an ‘indica’ experience that is physically relaxing & stress relieving. Snooze helps nourish when you are depleted or have over-extended adrenals so that you can rest & recover & do it all again! The ayurvedic ingredients contained within Snooze have been used for insomnia, stress, depression, restlessness & anxiety. Vital provides a ‘hybrid’ experience focused on preserving youth & maintaining physical, mental, & spiritual health despite the stresses of modern life. We also designed Vital to uniquely balance the effect of cannabis use. Formulated with Ayurvedic herbs to support mental stability, strong lung health, and to combat the drying effects of cannabis. The ayurvedic ingredients contained within Vital have been used to support vibrant skin & hair, strong bones, healthy appetite & digestion, ease the aging process, & counter mental decline. Prop 65 Warning: This product can expose you to chemicals, including cannabis, which are known to the State of CA to cause cancer or birth defects or cause other reproductive harm. We would love to hear from you. Shoot us a message….